(How obsessed you ask? Tshirts, posters, movies, figurines – if you could slap a dragon on it, I bought it (really not kidding)). Eragon, having survived the great battle, is saddled with a completely unexpected consequence – the Shade’s Curse. 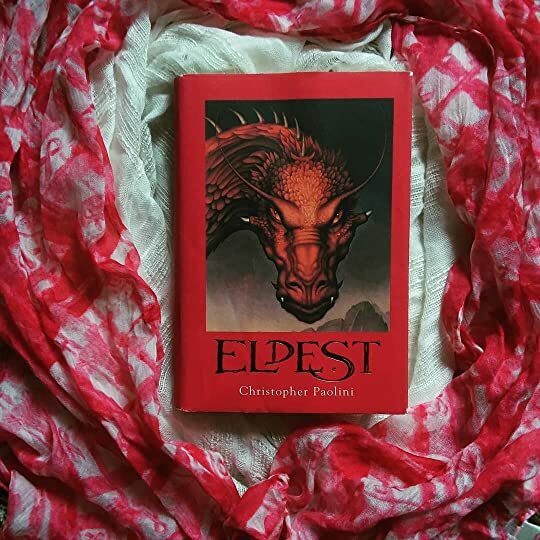 He and Saphira are sent to the hidden lands of the elves, Ellesmera, to learn the secrets of the Dragon Riders. But his training is not easy – the magic is challenging and literally one wrong move could trigger the Shade’s curse. At that instant, Eragon’s back ruptured in an explosion of agony so intense he experienced it with all five senses…and above all the feeling that Durza had just laid open his back. Meanwhile, Rowan (Eragon’s cousin) is dealing with a horrible situation of his own. The Ra’zac have returned to their hometown, Caraval, to terrorize the locals in the hopes of luring Eragon back. Eragon remains completely unaware as he trains in Ellesmera – leaving Rowan to find a way to save the entire town and track down Katrina (the love of his life) who was stolen by the Ra’zac. As much as I try to be objective about these novels – I can’t. They’re so entwined with my past that I simply can’t rate them anything below 5 stars. Dragons were my middle school “thing” – I drew them, I wrote about them and I read about them constantly. Unsurprisingly, this series spoke to me and it still does.